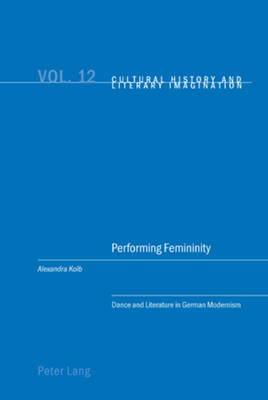 This is the first book to analyse the cultural representations of female identity that were created by the interaction between choreography and literary writing in German modernism. It explores the connections between dance, literature and gender discourses with a focus on a key period of the Austro-German dance scene: the years between 1900 and 1933. Drawing on influential feminist and gender theories, this book evaluates the choreographies of leading artists such as Grete Wiesenthal, Mary Wigman, Valeska Gert, Anita Berber, and the sensational `dream' dancer Madeleine Guipet. In response to growing criticism of ballet, German modern dance reflected and helped shape a reassessment of images of the female, embracing both essentialist and constructionist models of femininity. It also triggered a range of literary responses from dance artists themselves and from contemporary authors - some high-profile, others less well known. This interdisciplinary work offers analyses and part-translations of texts by Alfred Doeblin, Frank Wedekind and Carl Sternheim, amongst others, which have to date received little attention in Anglo-American cultural studies due to their unavailability in English.